Unfortunately it seems the website this was originally from is no longer in business, so I can’t provide a link for this one, sorry. 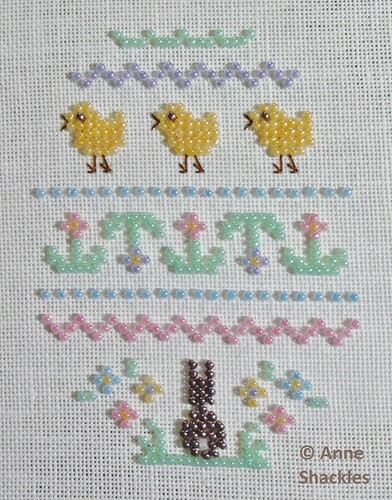 Anne S • This entry was posted in Beading, Cross Stitch, Easter, Finishes, Freebies, Serendipity Designs and tagged Beading, Cross Stitch. Bookmark the permalink. Too cute! Congratulations on the finish. And Happy Easter! Excellent post. Beading is a great hobby that my mom enjoys very much, she came across a new beading blog and she just fell in love with it. She recommends it to all her friends. Just wanted to share this with everyone that loves to bead. Once again thanks for sharing. Too cute! Congrats on the finish!